Ceres is the next of the Big Four asteroids that are being discussed. Ceres is the mother and Persephone is her daughter. As we all know Persephone lives with her mother half a year and with her husband Hades half a year. This is how they once defined the seasons. In order to show her happiness Ceres would bring the wheat and until Persephone has to go back her time with her mother ends at harvest. Her Glyph is the sickle. 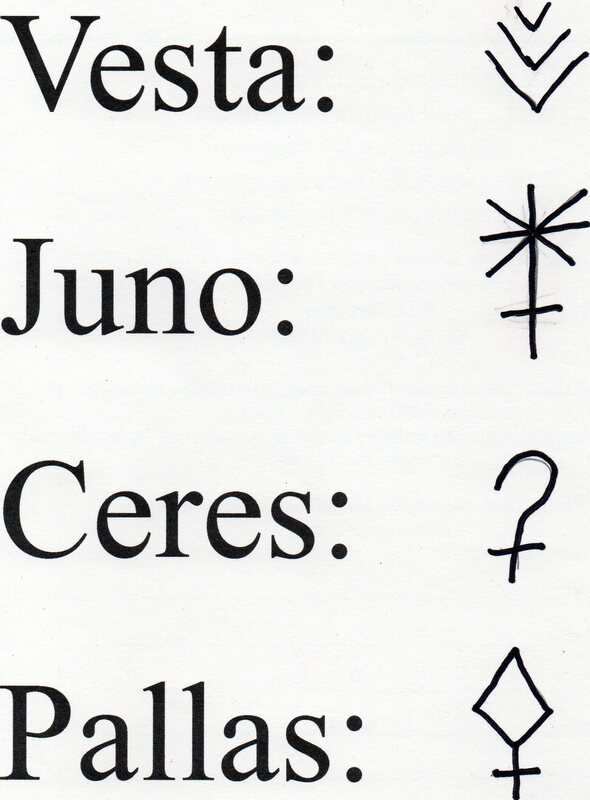 Each chart has a Ceres in it and this is a place where one can begin to look at their relationship with their parents, the mother in particular. Therefore parent/child issues often show up here. The same could be said of very supportive parents. The relationship of Parent/Child comes in every chart. Ceres is also food, remember she is barer of the wheat. All things wheat come under her jurisdiction, cereal, beer, bread all the staples. But with this said digestive issues related to food allergies can also be picked up here. The general ability to take care of oneself is the domain of Ceres. Are you able to take care of and nurture yourself? Are there residual issues from childhood related to parents? What is your ability to digest your food, in particular, gluten? Ceres is also the biggest of these asteroids and is now considered by scientists to be a dwarf planet. Lik e all the big four asteroids they can be found between Mars and Jupiter and Ceres is also close to Neptune. An easy combination would be Hades/Ceres for junk food. While Ceres passes over an Ascendant there could be an increased importance on things like shopping and meal preparation. There could even be an emphasis on taking care of yourself or caring for others. When it conjuncts the Sun there could be an increased awareness of nurturing and caring for self or others. In cases when a person has this natally the father could have been their nurturer. What does your own Ceres say about you?